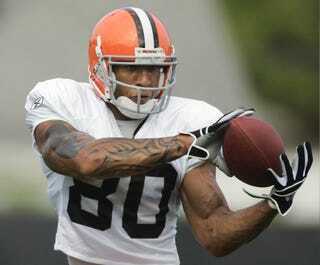 This website reported a PFT tip that Kellen Winslow was hospitalized with some testicle issues. Well, apparently all is well again down south, as this report has Winslow leaving the hospital earlier today. Don't expect him to play tomorrow; as he's been downgraded on the injury report, as well as by every woman looking for a man that's "father material." To the halftime updates! Packers 10, Seahawks 10. Here's an odd stat: Aaron Rodgers has three of the Packers' four rushing touchdowns this season. Rodgers was also 10-for-14 through the first half, and I've only counted three comparisons to Brett Favre so far. Jacksonville 10, Denver 7. They're not booing, they're saying "Drewww." Maurice Jones-Drew has 9 carries for 47 yards and a score. Denver really hasn't been able to sustain a drive since they scored in their opening series. Philadelphia 17, San Francisco 16. Andy Reid tried to get his team a long field goal at the end of the half. That attempt was blocked, and Donald Strickland ran that fucker back for a touchdown, and just like that, it's a 1-point game. Dallas 7, Arizona 7. Hard to score when both teams keep giving the ball back to each other. Doesn't help that the Cards are really getting buttfucked by the refs here.